The Heineken Cup was back to its best at the weekend with a host of last-minute finishes. Leinster drew level with Montpellier with a last minute penalty thanks to Jonathan Sexton, Bath were undone by a late score from second-row Richie Gray and three-time Heineken Cup champions Toulouse left it late to despatch Gloucester. But this week's Scrum Sevens looks at another side that has been involved in more than their fair share of incredible last-gasp finishes over the years. Re-live Munster's dramatic journey through the Heineken Cup and the moments they were on the wrong and right end of some heart-stopping last minute action. Munster reached the final of the tournament for the first time in the 1999-2000 season, eventually succumbing to an agonising 9-8 defeat to Northampton Saints. But had it not been for two last minute efforts during the group stages - when they faced their 1998-99 quarter-final conquerors Colomiers, Pontypridd and Saracens - then it could have been a very different story. Munster travelled to Vicarage Road, on November 28, 1999, to face a Saracens side which consisted of the likes of Thierry Lacroix and World Cup winning skipper Francois Pienaar. The two sides were neck and neck throughout but it was a young Irish fly-half come fullback who stole the show with Jeremy Staunton crossing late on to make the score 34-33 and bring Munster within a point of Saracens. 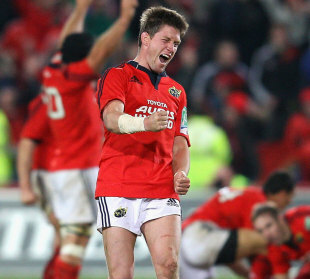 Ronan O'Gara nailed the conversion and Munster held off a late charge from Sarries to secure a 35-34 win. When Saracens travelled to Thomond Park on January 8, 2000, few anticipated a similar finish. But lightning did strike twice. Keith Wood was the try-scoring hero on this occasion with O'Gara's conversion striking the post before creeping over the bar to secure a 31-30 victory. Despite their pool stage heroics, and subsequent wins against Stade Francais and Toulouse in the knockout rounds, they came undone against the Saints in the final with legendary 'Hellraisers' Peter O'Toole and Richard Harris watching on. Munster fell foul to a controversial decision in their 2001 Heineken Cup semi-final with Stade Francais when John O'Neill's effort was disallowed by the referee who deemed the ball to have crossed the deadball line. And after progressing from their pool in 2002, they met the Parisian side once again and this time prevailed 16-14. They accounted for Castres in the semi-finals which teed up their maiden Heineken Cup final against the Leicester Tigers. Leicester battled to a 15-9 lead, thanks to tries from Geordan Murphy and Austin Healey, but were under pressure in the closing stages of the match with Munster awarded a scrum on the Tigers' 5-metre line. What followed has gone down in history as the 'Hand of Back' as the England flanker illegally knocked the ball from scrum-half Peter Stringer's grasp and towards the Tigers' forwards. The Welford Road side cleared their lines and despite Munster trying their best to mount one finale charge, the Tigers held on to claim the Heineken Cup. Munster faced the mammoth task of having to record a four-try bonus point victory and a winning margin of at least 27 points against Gloucester on January 19, 2003, to qualify for the quarter-finals of that season's competition. Tries from John Kelly, Mossie Lawlor and Mick O'Driscoll and three penalties from O'Gara set up a nail biting finish and in true Munster fashion they left it until the last moments of the match to secure the all-important fourth try. Kelly crashed over to the right of the posts leaving O'Gara with the conversion to ensure the 27 point margin. O'Gara's two points from the tee proved to be one of the last acts in what is now referred to as the 'Miracle Match.' Munster progressed to the semi-final, after beating Leicester Tigers but ran into a resolute Toulouse outfit at the Stade Muncipal. With the Irish side trailing 13-12 going into the last minutes of the match, O'Gara was unable to replicate his usual match-winning form - despite scoring an earlier try - as his late drop-goal sailed wide and Munster crashed out. Despite falling to Gloucester in the group stages of the 2003-04 tournament, Munster progressed to the quarter-finals and overcame the threat of Stade Francais before coming up against Wasps in the semi-final at Lansdowne Road. Munster trailed 17-15 at half-time before they struck back in the second-half - though it was without talismanic fly-half O'Gara who departed in the first-half with a hamstring injury. Tries from Anthony Foley and Jim Williams looked to give them the advantage but winger Tom Voyce struck after 80 minutes to give Wasps hope. And a late try from Trevor Leota - six minutes into injury time - proved to be the deciding score as Munster snatched defeat from the jaws of victory, in what can only be described as a taste of their own medicine. The Wasps coach Shaun Edwards reflected on the epic match saying: "You wouldn't rub that off your video, would you. That was probably the best game I've ever seen." And director if rugby Warren Gatland waxed lyrical about Leota saying: "It takes us 10 months to get him fit but when his weight's down he's mobile and plays good rugby. He's been known to sneak off to McDonald's and KFC from time to time but he can do whatever he wants tonight." 2006 - Who you gonna call? Having taken the 2006 final against Biarritz 23-19, Munster looked to make it back-to-back wins when they turned out for the 2006-07 season. First up for the reigning champions were Leicester Tigers at Welford Road. After Donncha O'Callaghan and David Wallace's first-half tries, Munster then fell behind with 10 minutes left on the clock thanks to a Leicester penalty try. But it was that man O'Gara again who stepped forward - after lighting the blue touch paper prior to the game saying: "At the minute I don't know many of the English players on a friendly basis and I'd say a few think they're better than they actually are in reality" - and from a fair old distance kicked the winning penalty. O'Gara apologised for his comments post-match and Munster had started their campaign with a win. But it was a campaign to forget for the men in red as they lost their proud record at Thomond Park to, ironically, Leicester in the final match of the group stage as the Tigers came away with an impressive 13-6 win and Munster went on to crash out of the competition on March 30, 2007, at the quarter-final stage to the Llanelli Scarlets. Having taken the 2007-08 campaign, Munster were under pressure to perform before they started their defence of the crown against Montauban in front of a capacity crowd of 25,000 at the redeveloped Thomond Park. The French side were barely given a hope as they rocked up to face the champions but once again O'Gara had to save Munster's blushes with a late penalty to give them a 19-17 win. And Munster left it late against Clermont later in the pool stage having to rely on tries from Marcus Horan and Niall Ronan to get them across the line against the French giants. However, despite their last-minute heroics, it proved to be in vain as they crashed out in the semi-finals against perennial rivals Leinster who went onto claim the 2009 trophy. After failing to progress from the pool stages in the 2010-11 tournament and with many of Munster's stellar names reaching the twilight years of their career, teams were starting to eye the Celtic league champions as less of a potential obstacle than before. And their opening match in the 2011-12 season was against Northampton Saints - the side who suffered heartbreak in the 2011 final against Leinster. A late James Downey try gave the Saints the ascendancy but as sides have surely learnt about Munster over the years, the match is not over until the final whistle is blown. And after 41 phases, O'Gara stepped up in the pocket to slot the drop-goal to take the match 23-21. The reaction was akin to a Heineken Cup win with supporters and pundits alike failing to contain their excitement - as RTE's Michael Corcoran illustrated claiming there had been 100,000 phases in the build-up to O'Gara's drop-goal.